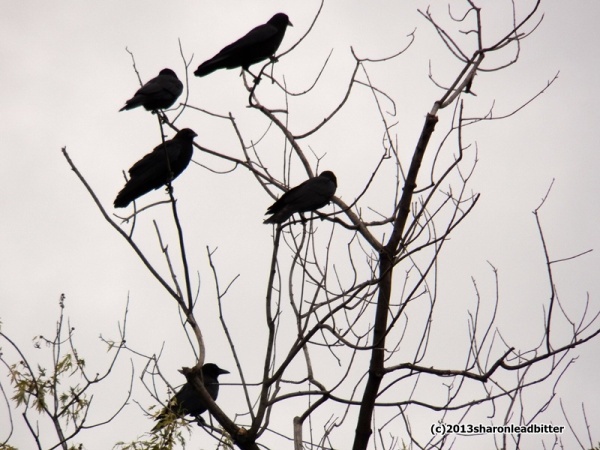 Since the first big flock returned ten days ago Pittsburgh’s winter crows have been gathering at dusk in Oakland. …until they landed. In the trees they have a lot to say and keep saying it until dark when they silently leave for the roost. Their roost location is still evolving. In October and early November they favor the trees near Soldiers and Sailors Hall but typically move to Polish Hill by Thanksgiving. I can tell where they spent the night by the marks on the sidewalk. 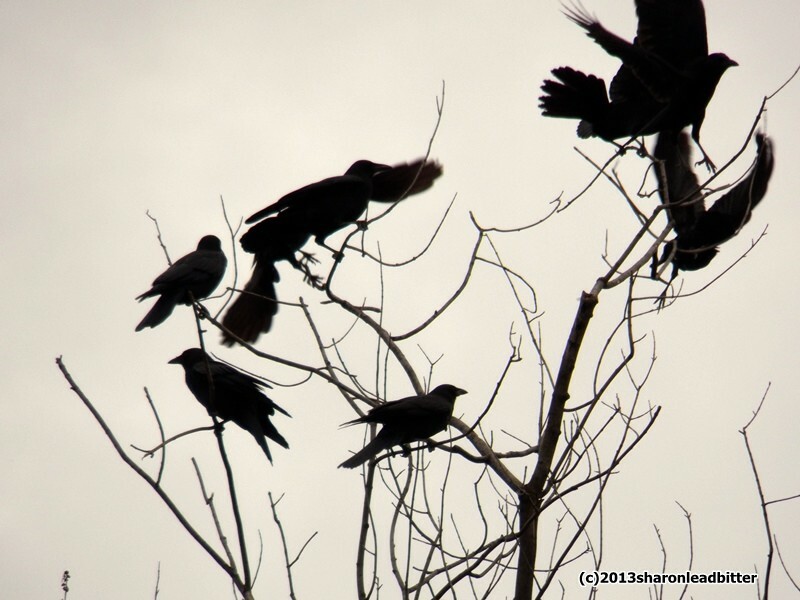 The crows have favorite trees they return to each evening. On Monday a lot of them returned to a surprise. 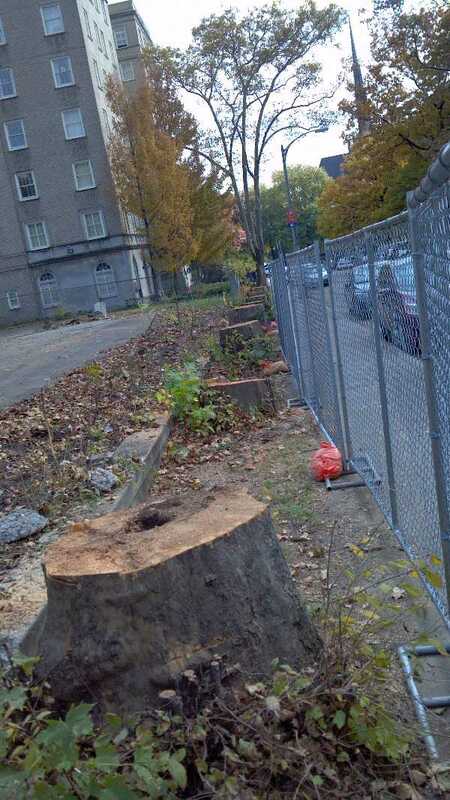 While they were away, eight of their roosting trees disappeared from Ruskin Avenue. Literally disappeared! 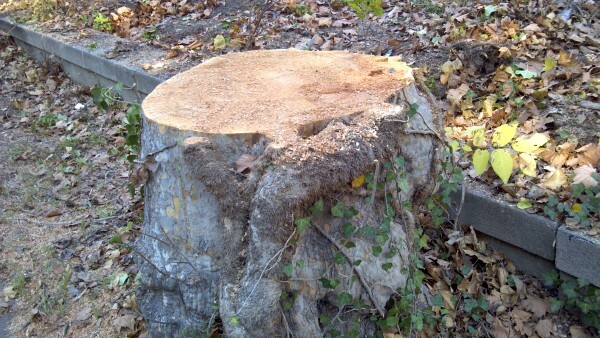 Here’s what’s left of one of the London plane trees. Click on the photo to see the row of stumps. A couple of Novembers ago I counted crows roosting in those very trees and estimated 40 crows per tree that night. Multiplied by eight my guess is that 320 crows had to find a new place to roost on Monday. This was significant. I wish I’d been there to see their reaction. What did they do? They probably shook their heads (“Those humans were at it again!”) and moved on. After all they’re transient. They sorted it out. It was no big deal. When the line storm of wind and rain came through last night I wondered about the crows. They perch at the tips of the branches on the tallest trees. It would have been quite a challenge for about 10 minutes at 3:30am. Right you are, Anne Marie! I live in Oakland, and can’t stand them. 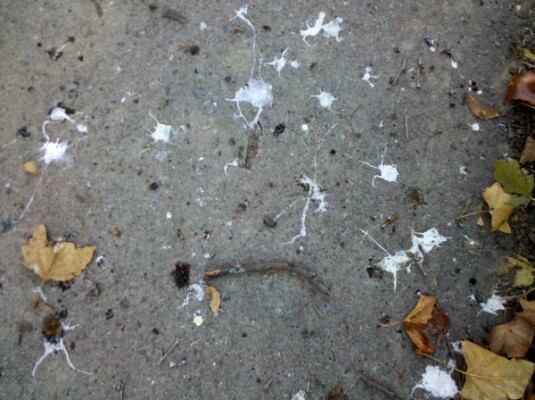 They are very noisy, and very dirty….covering all surfaces with poop. Are they enroute to migrating for the winter? Where do they roost during the day? Cindy, these crows are visiting for the winter. During the day they fan out around the Pittsburgh area to find food, sometimes at dumpsters, landfills & roadkills. In the evening they *all* gather at the roost. Right now the roost is in Oakland but it will move — probably toward Polish Hill — as the winter progresses.